If I was to ask you if you want to manage your time effectively, I’m sure the answer would be yes; but you’re not yet sure how. The key to more effective time management is to prioritize your tasks correctly. There are various prioritization systems, one of the most popular ones is the Four Quadrants Time Management. For this to work, you'll first need to create a list of your tasks. The more tasks you create, the better. Ideally you will list down all your planned activities. You may use the old fashioned pen and paper for this but a sophisticated tool will be better in almost all cases. I recommend downloading Swift To-Do List for Windows. Swift To-Do List can easily be customized for Four Quadrants Time Management, as you can change the task priorities to reflect the actual four quadrants. 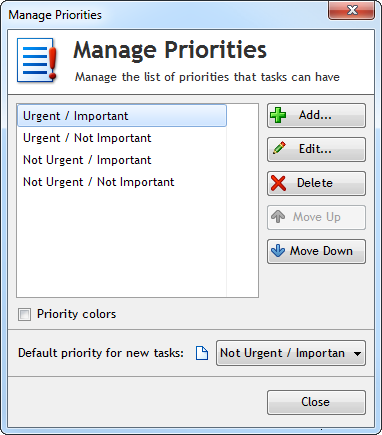 Simply use menu Manage - Priorities to customize the priorities. After you create a list of tasks and separate them into the four quadrants, you should be able to see clearly which tasks to do first. Focus on the first quadrant, as this quadrant should contain only the tasks that should be dealt with as soon as possible. It might not necessarily be the most attractive quadrant for you, as most of your goals and plans you wish to achieve will end up in the second quadrant. Tasks in the fourth quadrant that are neither important nor urgent are mostly time wasters. If you wish to effectively manage your time, you should reduce or eliminate tasks in this quadrant. You should try to get rid of tasks in the third quadrant as well but they're mostly tasks you didn't plan for so eliminating them might be tricky. Reducing and/or eliminating activities in quadrants three and four will allow you to spend additional time on the activities in the first two quadrants in order to remain efficient. Preferably, you need to learn how to manage your task so you rarely have activities under the first quadrant. These will be the tasks to deal with as the top priority. The fewer tasks there are in the first quadrant at a time, the easier it is to focus on them. How can you avoid distractions and the activities in quadrant three and four in order to remain focused? Well, the best resolution is to schedule your time. Schedule time for task with higher priority and maintain some open time daily for networking tasks such as building relationship and mentoring. A highly effective approach for time management is to manage the peak and non-peak productivity times daily. Generally, higher productivity times will be in the morning. Early afternoons after lunch break are generally less productive. Try to especially focus on the first quadrant in the morning. A crucial and important aspect when it comes to planning and prioritizing would be learning how and when to “Say No”. While it will be tempting to answer a phone call from a close friend, allowing it to ring when you are working on priority task may be the smarter move to make. Learn how to appreciate your time and then get other people to do the same. Here is an example of how the Four Quadrants can look in Swift To-Do List. If you'd like to keep the quadrants totally separate you could create 4 separate trees (folders) instead, one for each quadrant. Swift To-Do List is a 4-quadrants compatible task manager for Windows. You can organize all your tasks and notes with our specialized task and notes organizer. Download this personal time manager today and immediately reap all the benefits.